I read as a devoted reader—that is, I enjoy letting a writer’s work flow into me. I surrender to a book, sip, swallow, dream about it and move on to the next. But I read in another way, too: as a writer. And that writer is a magpie swooping down on the "shiny bits" (as Margaret Atwood called them in Negotiating with the Dead) and carrying them off, hoarding them and turning them over in the light. She likened writers to jackdaws—I've chosen the magpie, but the notion is the same. The bright bits hold a seductive appeal for everyone, and certain of them are irresistible to other writers. This piece cites passages from a few recently published books of Canadian poetry to illustrate a writer's way of reading. There are lines and passages that dazzle most of us when we first read them. Over time, some might start to seem like flashy baubles, fool’s gold. Or the wires seem to be showing, the makeup rubbed off. You’ll find such lines on T-shirts, coffee cups and j-peg “posters” on Facebook. It’s hard to keep a good line down, though. There will always be new readers who haven’t encountered it before. It’s best to avoid word-weariness, and, instead, to take vicarious pleasure in the thunderstruck reactions around you. “Oft turning others' leaves, to see if thence would flow/ Some fresh and fruitful showers upon my sunburn'd brain.” Sidney was right—writers turn to literature for inspiration, even if it induces envy or, at times, borderline despair. We could easily throw up our hands and declare that Shakespeare said everything first and best, dammit, as we go about “Desiring this man’s art, and that man’s scope” (Sonnet 29). But some of us are incorrigible. We press on. I won’t get into a long discussion about the Deeper Meaning of the legacy of words. (See Harold Bloom’s The Anxiety of Influence and, for a contemporary look at plundering, appropriation and allusion, Jonathon Lethem’s “The ecstasy of influence: a plagiarism”.) A restless bird, I’ll just hop to a few examples from recently published books of Canadian poetry. avowed comely, lueur d’avril bespoke, bespilled—ça brille. A few months of feeling plowing under, ourselves. A few months of feeling ploughed under ourselves. He can also wring your emotions, as he does in “Organ Donors” with the post-mortem song of a grackle: “Each better place is next to nothing, he sang/The difference is both hard and clear.” I aspire to twist, amuse and change registers in this way. Themes can be shiny bits, too. I’ll admit that when I read the “The Decor,” the first poem in Ken Babstock’s Methodist Hatchet, I was annoyed. I felt as if he’d scooped me. Before I returned to writing poetry four years ago, I wrote for years (and still do) for design magazines. He was skewering the very stuff I intended to grapple with—I had in mind an Edith Wharton-esque mordancy on the topic, translated into a poem…and there it was! But, much as I like his poem, I won’t give him the last word: it’s still on my list of subjects to tackle. 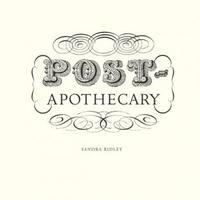 Sandra Ridley’s poetry collection Post-Apothecary is a gothic marvel of delicacy and toughness. It’s almost painfully beautiful as it anatomizes pain. From “Rest Cure”: “Thorax cracked & ribs cut & her tongue-flicked teeth./Abacus pearls.” From “Blood-let”: “A husk of blue-veined cocklebur/He turns the thumbscrew hourglass of sand.” From “Unguent of Blackthorn”: “She’s bramble. She’s oak burl./She’s bone-fuse. She’s withered branches suspended by chains.//She’s nightshade & a numbered grave.” I crave this exquisite degree of finesse. Look in thy heart, and write: sure. But pump it up. Make sure the finest lines are circulating through it. Kateri Lanthier was born in Toronto and has lived in St. Catharines, Sudbury and Kingston. She has a BA and MA in English from the University of Toronto. After working as an editor in educational publishing, she became a freelance writer for magazines, television and the web, specializing in design, architecture and fine art. Her poetry has been published in literary journals and magazines in Canada, the United States, and England, including Descant, Grain, Matrix, The Antigonish Review, Acta Victoriana, The U.C. Review, The Greenfield Review, Saturday Night, Quarry, Writing Women, London Magazine, The Toronto Quarterly, www.levelerpoetry.com and www.lyrelyre.com. Her first collection of poetry, Reporting from Night, was published by Iguana Books in December 2011. She is currently at work on a novel set in Toronto’s Beach neighborhood, where she lives with her husband and three children.